Harvesting premium quality hay is often out of your control, relying on good weather and a lot of luck. Producers are now seeing the benefits of conditioning hay for consistently better results. The Tube·Line Accelerator is your fastest way to better hay by reducing drying time, creating greener, sweeter and softer hay. 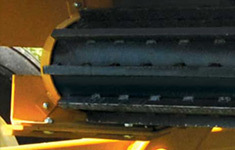 The Accelerator’s easy operation conditions hay by simply running it through adjustable steel crimping rollers. This process cracks the hay stems without knocking off the leaves. Conditioning also fluffs the hay, allowing air to flow through the swath, for faster and more even drying from top to bottom. 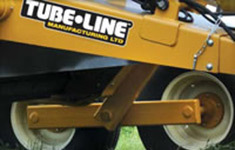 Speed up your operation with the Tube·Line Accelerator producing better hay, faster drying time and bigger profits. Contact your authorized Tube·Line dealer for more details. 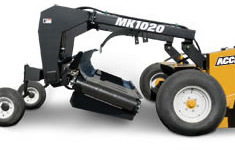 Inverts the swath and places it on dry ground. 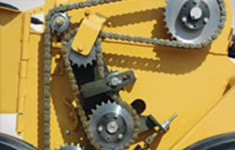 It is also used to combine up to three swaths into one.